I had tried weaving some Sami bands on the little Peacock loom, but it was only working so/so. 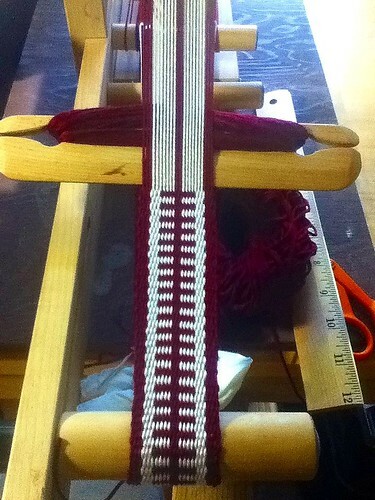 I had to take off several pieces of the loom, and that didn’t seem quite right. I never considered getting a regular-sized inkle loom, however, because I did have a mini one that was really cute and I never used it. I gifted it to someone and figured that was the end of my band weaving. But never say never! 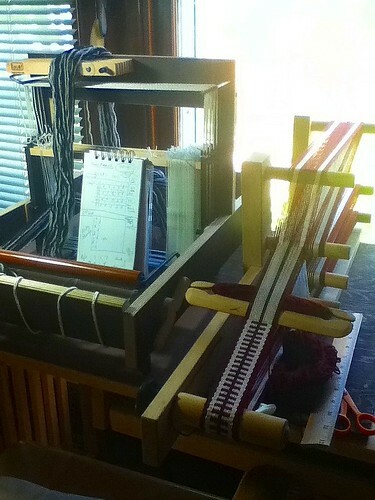 I have to admit, weaving on a decent-sized inkle loom is great. I knew how to tie the heddles and warp it already, and so I picked a very simple pattern from the Helene Bress book that came with it, and away I went, weaving a ladder band. For anyone who is interested, Jane Patrick has a great how-to video on warping and weaving an inkle loom that can teach the basics.